We finally started our hike on the Grand Enchantment Trail. I had hoped to start a few days earlier, to avoid high heat later on, but the drive west took a bit longer than we expected. We wanted to enjoy the journey, so we didn’t push, at all. We got a late start today thanks to a long drive out to the trailhead and a couple of time-consuming delays at home. Breakfast was delicious, but the missing car keys were not found, despite a long search for them. 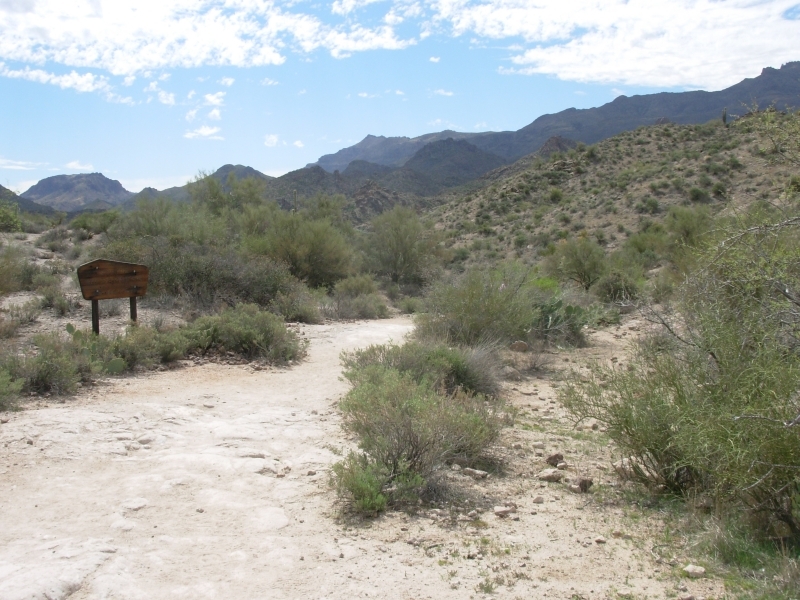 My brother Jeff drove us to the trail at First Water Trailhead, then hiked with us for the first mile and half. We started hiking at 10:45, then spent a while talking to a large group of dayhikers. While looking for snakes, Jeff found some pottery buried in the sand. That is so like him! 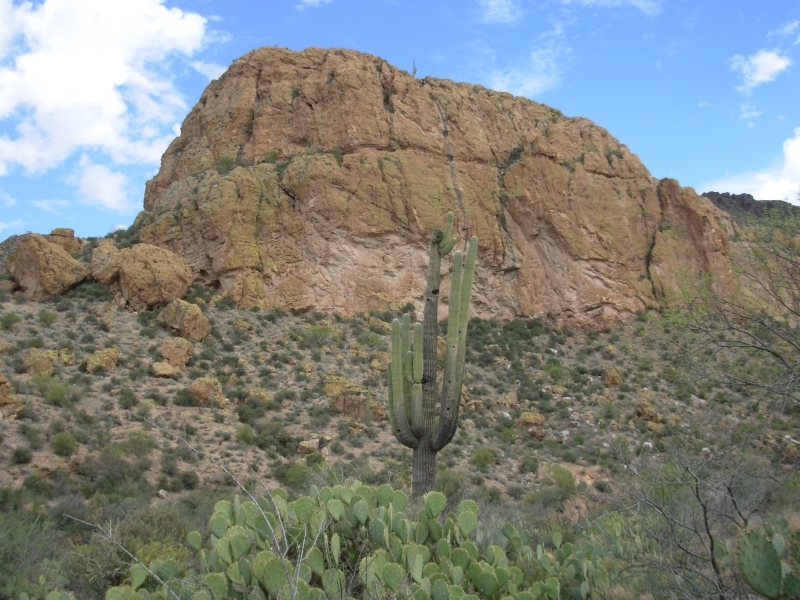 This is our second visit to the Superstitions. 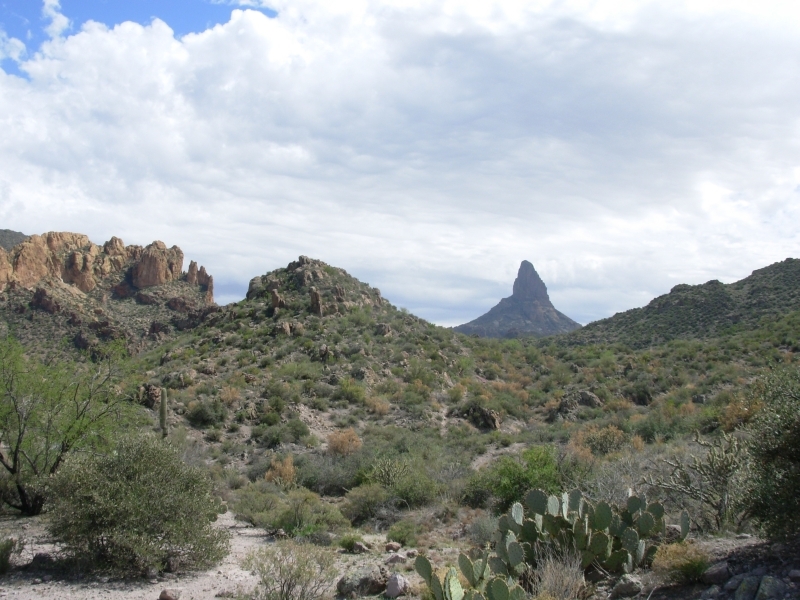 The first, nearly 10 years ago, was a dayhike loop around Weavers Needle. 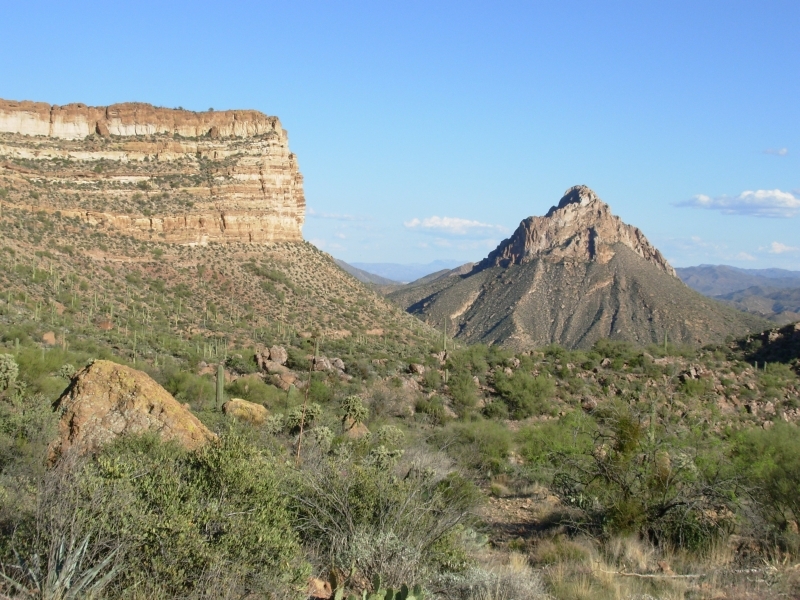 It is a beautiful wilderness area: lush Sonora desert, orange cliffs, many interesting rock formations. 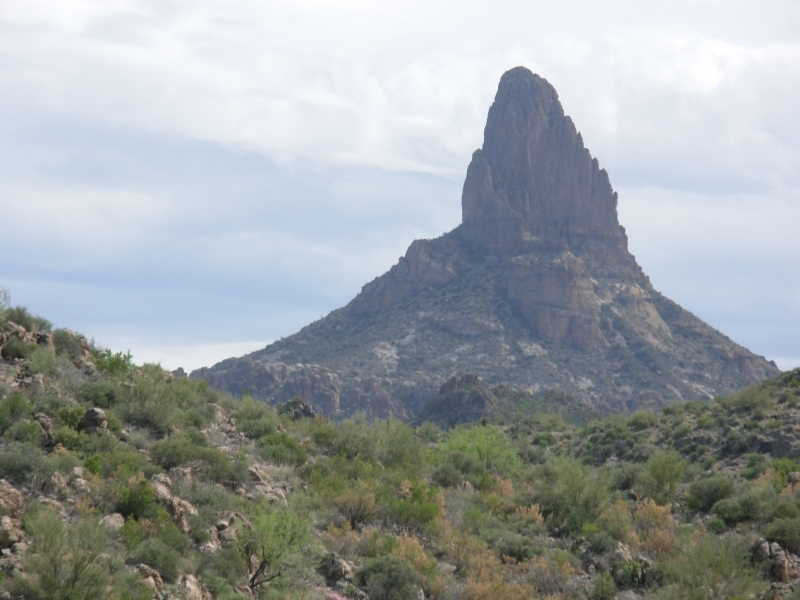 There are volcanic plugs like Weavers Needle and Miners Needle that rise high above the other ridges. The trail winds in and out of many drainages. The mileage was greater than listed in the guidebook, thanks to all the winding. We arrived an hour or more later than expected at our campsite near La Barge Spring and it was almost dark. There was a lot of up and down, but nothing major. Still it wore us out. Some of the trail was good; some was loose gravel. I fell twice and Jim fell once, bloodying his elbow. Spring is here. 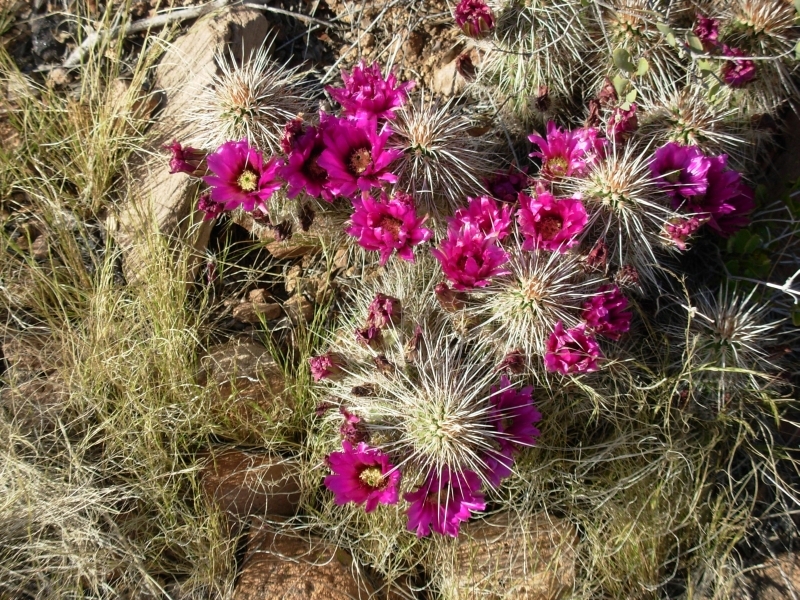 There were many varieties of wildflowers: Indian paintbrush, poppies, a purple onion, hedgehog cactus, Mormon tea, willows, holly and many more. There was nothing in profusion, but a little bit all over. I enjoyed that. We saw no wildlife except birds and lizards. There were a lot of other hikers, including a group of about 40 dayhikers, two horse groups, a couple of backpackers on their way out and four women camped by the spring. Being so slow, we were desperate for water when we reached the spring. Fortunately, it was a good one, a cement trough with lots of cold water. We really needed that. 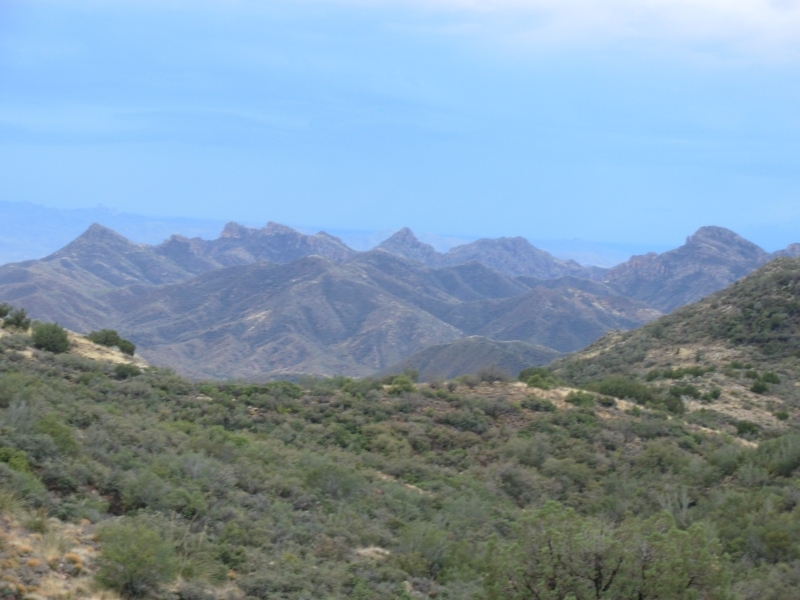 It wasn’t all that hot today – low 80’s --and it was cloudy off and on, but still we were sweating on the climbs. It sprinkled a few drops as we walked and a few more after we set up the tent. 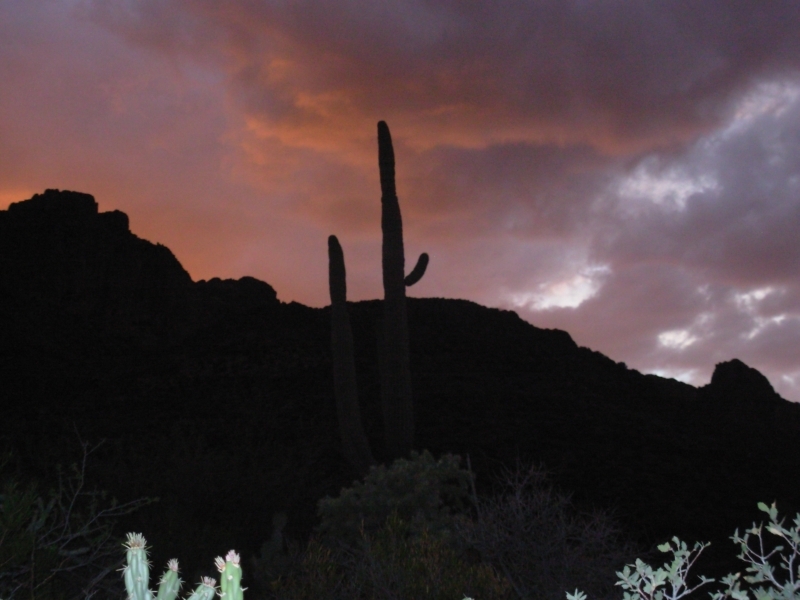 The forecast is for cooler weather with a chance of rain for the next few days. It’s good for walking, but hard on the photographs. Our camera doesn’t handle gray skies very well. We’re both feeling beat up: sore muscles, sore feet, scrapes, cactus punctures, and just plain tired. After we went to bed last night, it began to rain in earnest and kept it up off and on all night. We woke to the sound of more rain, so we rolled over and went back to sleep. By 7:30 it stopped and the birds were singing, so we got up and started our day. Even so, it was a wet day. The morning included three light showers – but not enough rain to cause us to put on a rain jacket. Then at 2:00 p.m. it began to pour. Lightning and thunder accompanied the rain. One clap of thunder was right overhead; most were about a mile away. We were, of course, climbing an open ridge at the time. Then the sun came out again, after an hour or so downpour. The bushes were soaked so we stayed wet all afternoon. Tonight was another dinner in the dark. Both nights we’ve arrived at 6:30, just as it was getting dark. The hike again took longer than expected, either because the guidebook mileage is off or because the overgrown rough trail is slowing us down. Probably both. 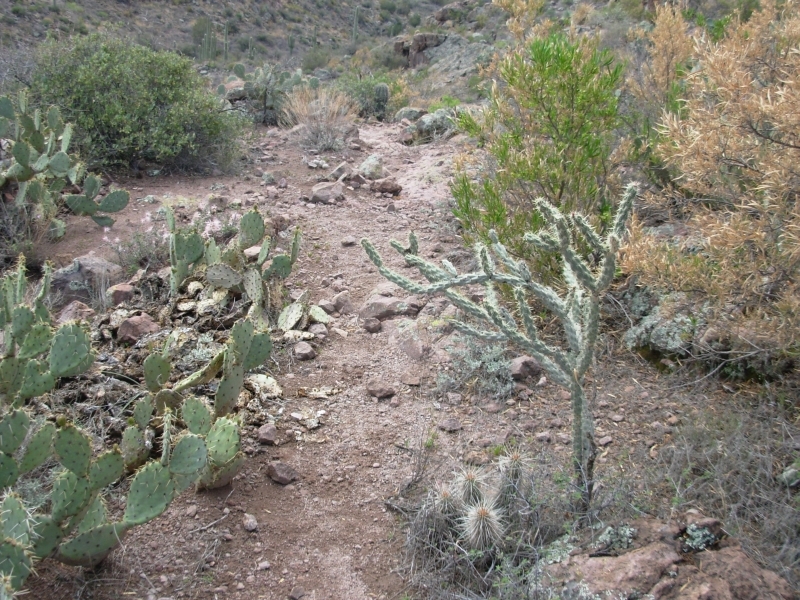 Parts of the trail are overgrown and in other places you just have to step carefully because of loose rocks or cactus growing on both sides of the trail --cholla on one side, prickly pear on the other (what we call a "cactus trap"). At 6:00 it sprinkled again; then as we were getting into the tent, it began pouring again. It’s good for the water pools (our only water source today) but not a lot of fun to hike in. There were some dramatic cliffs and mountains, but we took few photos because it was so dark. We mostly had the trail to ourselves except for three dayhikers near a trailhead. 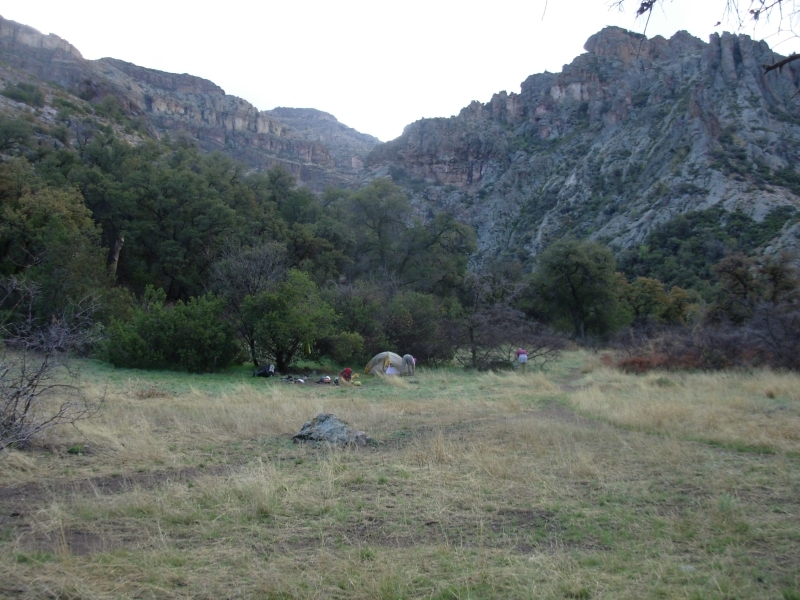 When we reached Angel Basin, our planned camping area, it was already occupied by a couple of different groups. We were so tired, we didn’t care. We set up nearby anyway. It was pretty hiking today, interesting land with lots of up and down. The push for miles took away a lot of the enjoyment though. This isn’t a good land to rush through. Just after we went to bed it began to rain – hard. It poured for a couple of hours and we got flooded, with water under the tent and into the tent. Everything got soaked. It was also a noisy night. A couple horses wandered around loose and one almost tripped over our tent. The horse group was German. They had a real problem: part of their group led the horses downstream ½ mile to get water and one horse fell. They unloaded him and left the saddlebags behind. 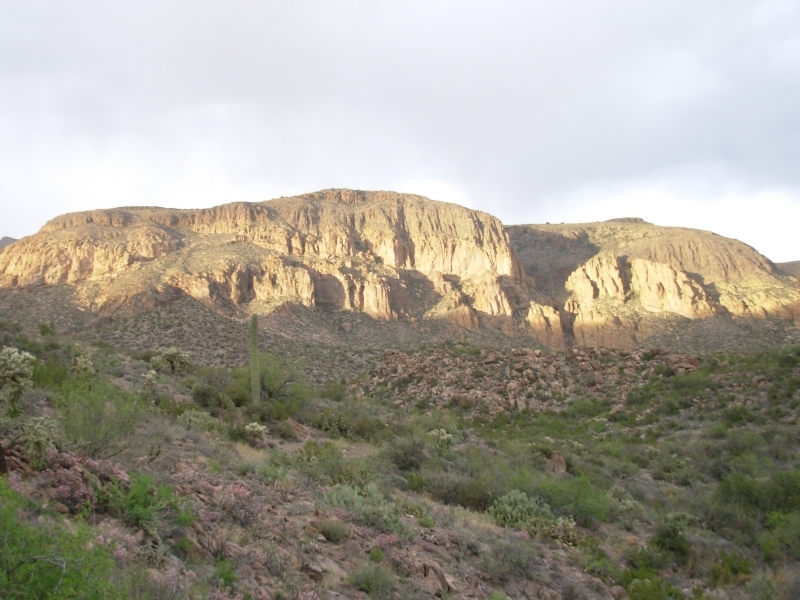 But then it got dark and they lost the trail and ended up following the rocky streambed back. We heard about it this morning. Last night all we heard were unhappy voices, horses, and digging in the rain (trenches?). We passed a cliff dwelling this morning. It was mostly gone, but a few partial walls remained in a cave above the trail. We didn’t climb up the cliff for a closer look. It was almost 9:00 when we left camp and it started to rain again soon afterwards. We didn’t care enough to climb to the cave in the rain. We followed Rogers Creek uphill for a while. After a mile or so there was flowing water in the creek. A rare sight! Down below there were just some small rocky pools. There were a couple of temporary waterfalls thanks to all the rain. 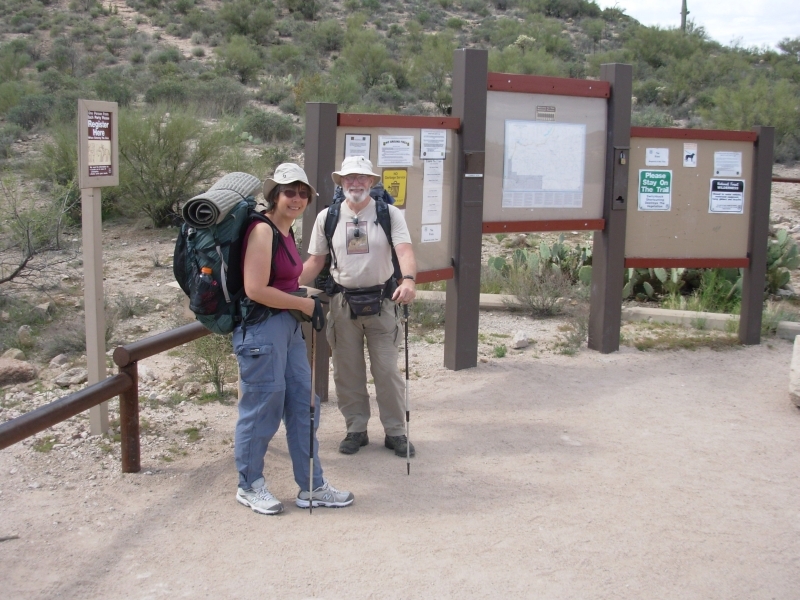 We joined the Arizona Trail (AZT) after 2 ½ miles. 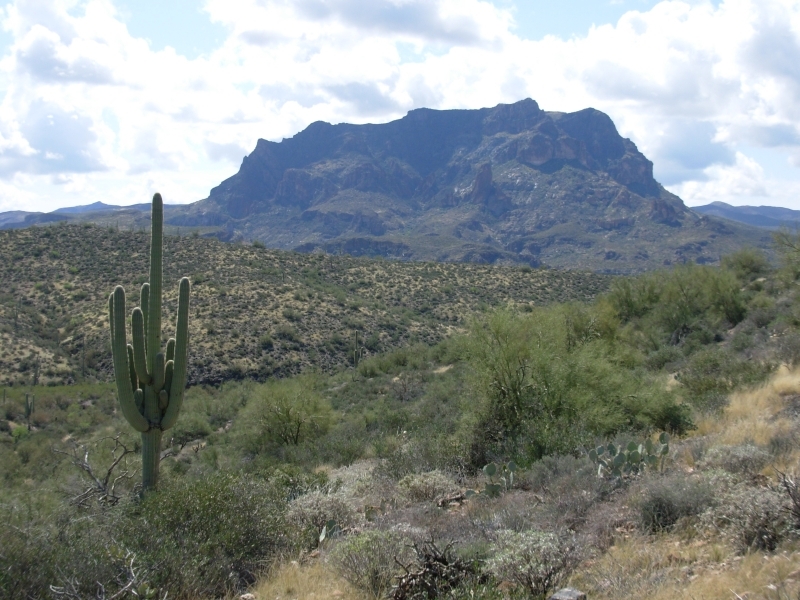 It had nice tread, much better than elsewhere in the Superstitions. Then we left the wilderness area and followed a jeep road for a couple of miles. There were lots of jeeps and ATV’s, including one tourist group of about 10. There were lots of backpackers out too. Three groups headed in as we left the Wilderness, and it’s only Friday. Saturday will really be busy. We saw no wildlife except a gray squirrel. There were lots of tiny frogs yesterday, thanks to the rain. At lunch we tried to dry things out. The sun made a couple of brief appearances, but mostly it was cloudy. 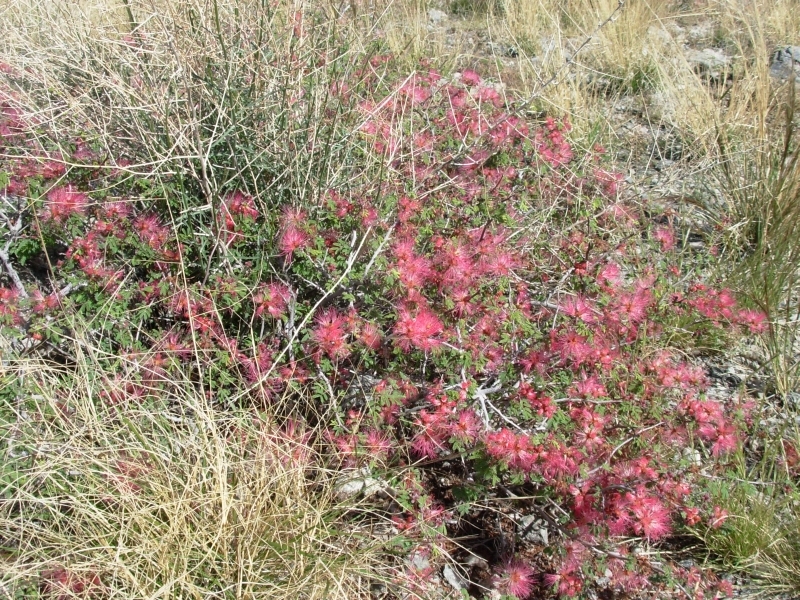 We climbed to about 5500’ in scrub oak and juniper. This afternoon we began to drop again – 1700’ in 1.2 miles, or maybe 2.1 miles. I really don’t trust the guidebook mileage when the trail wiggles, and this one switchbacked through oak and mesquite a long way. It wasn’t THAT steep. We reached the creek below and followed it for about three miles down to the road we had followed earlier. 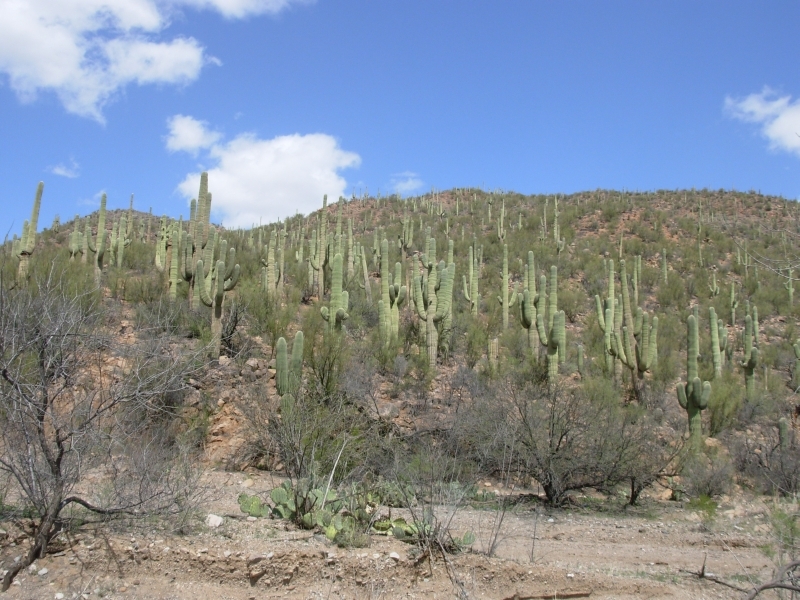 The area was lush, with green cottonwood trees and healthy cactus. 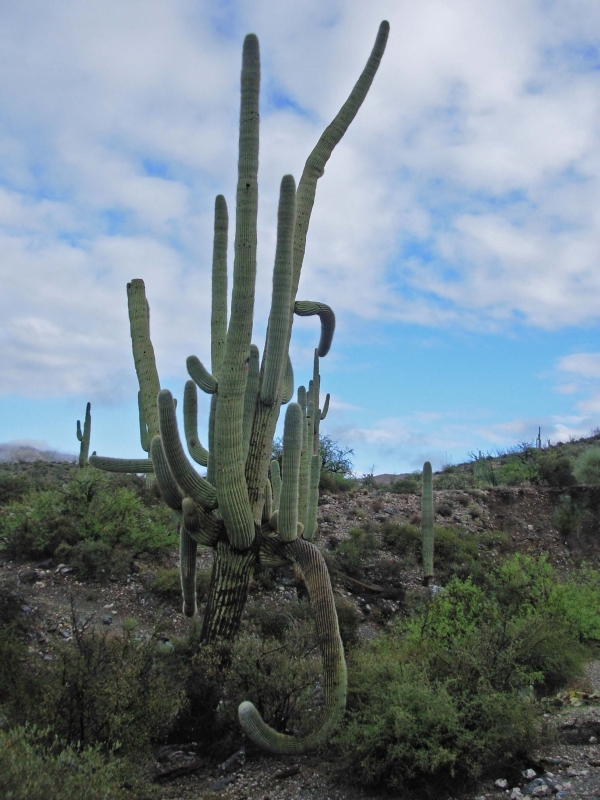 One saguaro had at least 15 arms, a couple more at least 11. 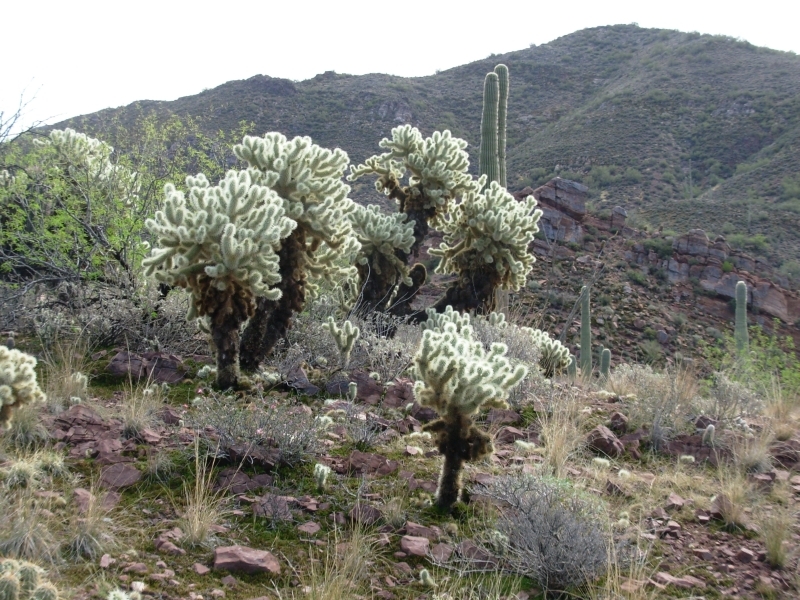 The cholla was as tall as I am and sometimes a foot or two taller. 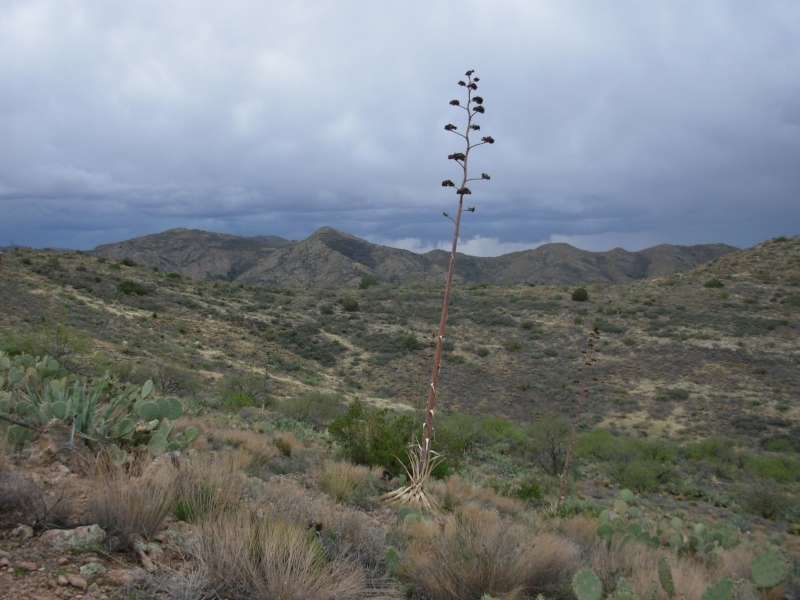 The ocotillos were in leaf, thanks to all the rain, but not yet in flower. Clouds threatened all afternoon, but it never did rain on us. We stopped early to attempt to dry out our still wet gear. 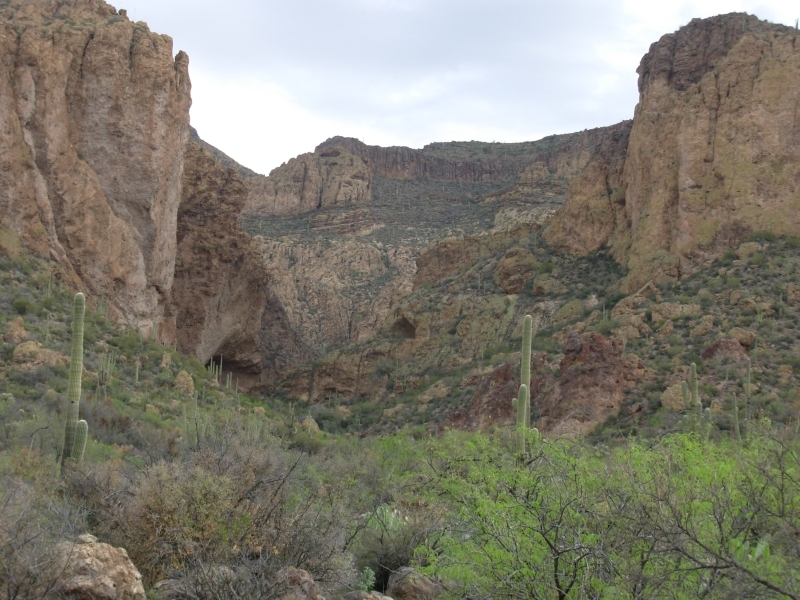 It’s a pretty canyon; dry, but we’ll reach water in a few miles, so that wasn’t a problem. We saw two deer as we were descending into Reavis Trail Canyon. It was good deer country, with lots of grass under the mesquite trees on flat benches. It rained off and on all night and again while we packed up this morning. After that the clouds moved off and we enjoyed a cool sunny morning. The hiking was nice, on good trail. 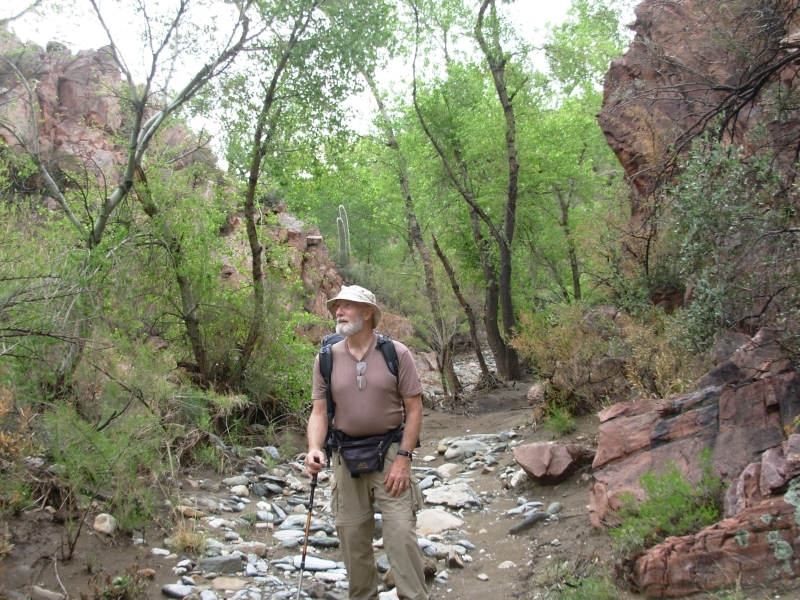 We passed through a pretty red rock canyon, with water in the creek. 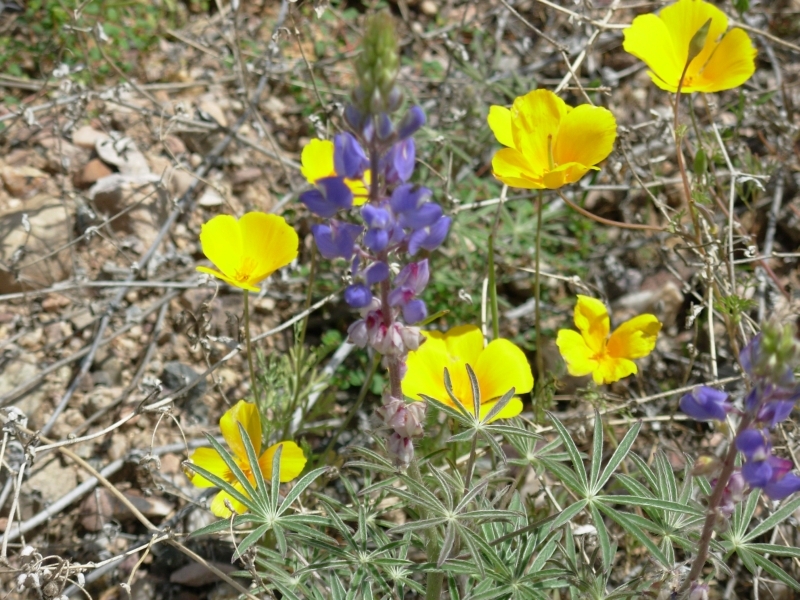 There were lots of different wildflowers. Our only wildlife was a buzzard, a black hawk (dark with a white stripe on its tail) and a rabbit. No people. 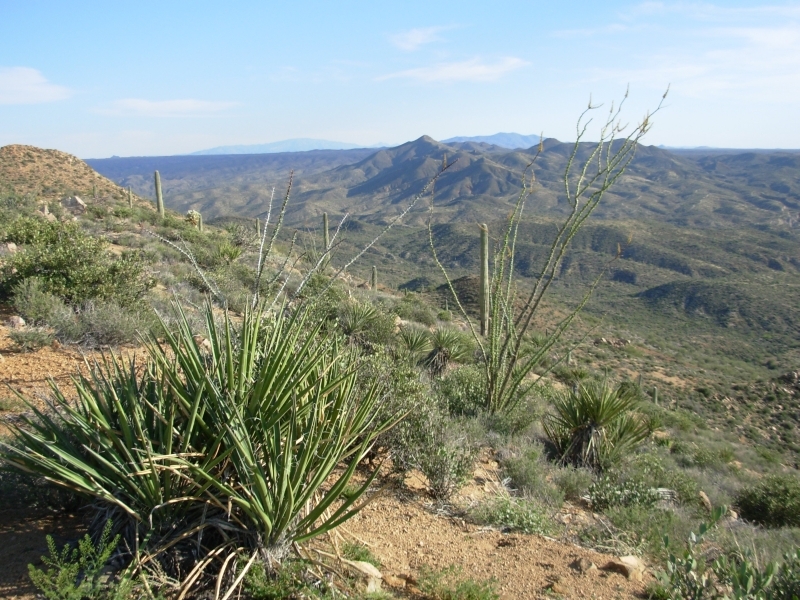 We climbed to a ridge which we followed straight south toward Picketpost Mountain. 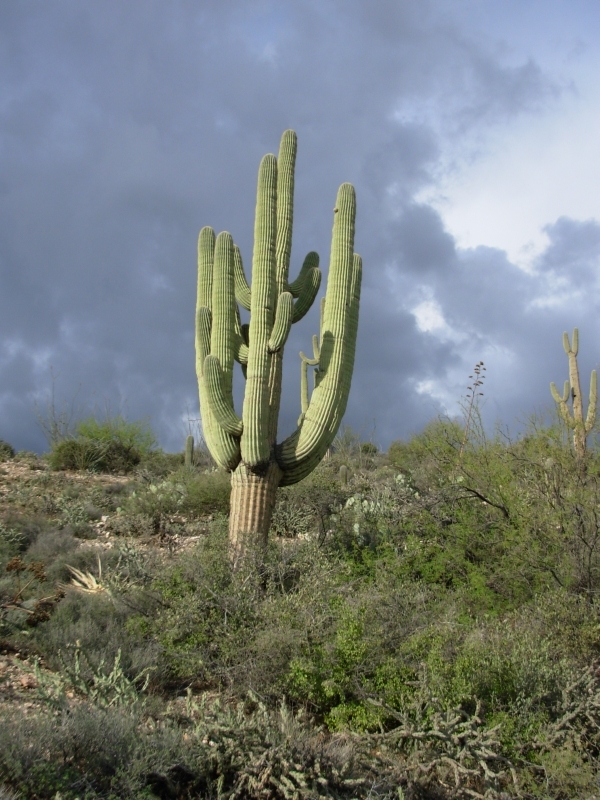 It was pretty country with some lush desert – lots of healthy saguaros and other cactus. We passed under the freeway toward the trailhead, which turned out to be unconnected to the highway, so we bushwhacked up a dry wash back to Highway 60 where we started walking toward town. After about ½ mile, a roofer picked us up and drove us the remaining 4 miles to the town of Superior. We got a room at the only motel in town. I had made a reservation, but ownership of the motel changed on Thursday and my reservation was lost in the confusion. Fortunately, they still had two rooms left. It’s not great, but the shower is hot and the bed is dry. We washed clothes in the sink and tied a line across the room. Our wet tent and sleeping bags are hung outside. We got a ride to the grocery by asking a local for directions. It’s not that far, but the road was flooded and we would have had to detour to find a bridge across. It was easier for him to drive us than explain where to go. First we ate a good hamburger at Casa Piedra Roja, a block from the market. It was really welcome. I especially enjoyed the lemonade. After lunch, we bought our groceries for the next week. Our room wasn’t ready yet, so we went looking for fuel for the stove. No luck. Nobody carried HEET. One store carried a somewhat similar product, which we bought, but when we tried it, it burned really sooty. The label didn’t say what was in it, just that it was for gas line freezing. It was probably red HEET, not yellow HEET. I’d rather just use the fuel we have left over and hope for the best. It should last until Mammoth, another four days or so. We tried four different gas stations. There’s no telephone at the motel. If there were, I’d call Sly, who is hiking the GET in a couple of weeks, to warn him about the lack of fuel. Superior reminds me of some of the towns we've hiked through in New Mexico – an old mining town, past its glory days, with half the stores empty and boarded up. There are lots of liquor stores, a few restaurants and a lot of run down houses. It’s sad, because the town used to be nice, nestled in beautiful mountains. Like Anaconda, the smelter dominates the town. I don’t think the mine is active. 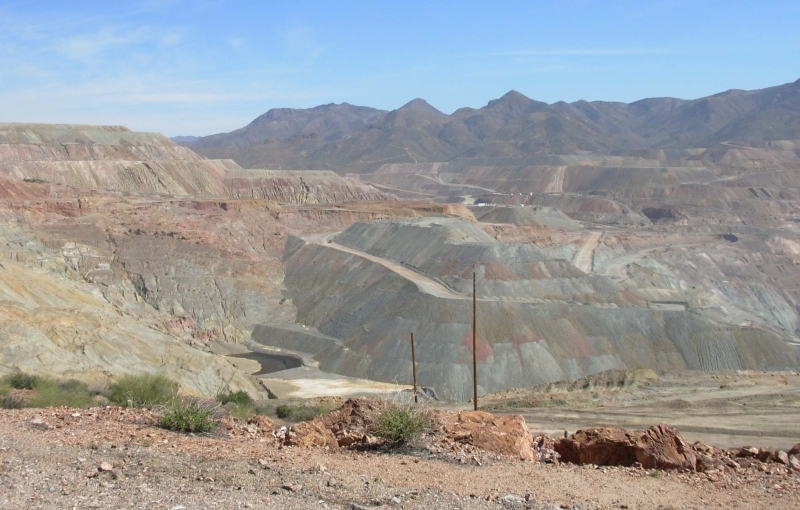 I know a lot of the mines in Southern Arizona closed down about 20 years ago, thanks to a combination of low copper prices, mistimed union activity and EPA requirements to clean up their emissions. 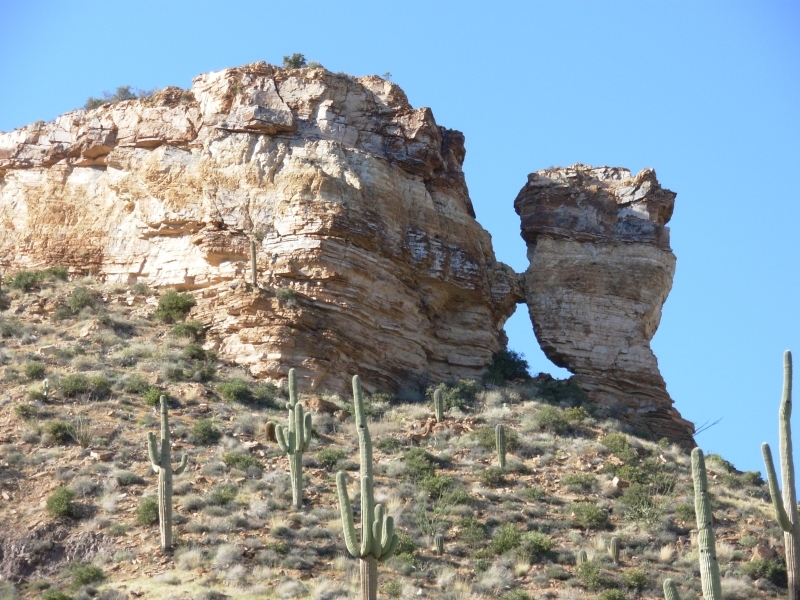 It was a bright sunny day – 70’s, but it was hot climbing and today had a lot of uphill. We got an early start after a nearly sleepless night. No reason for that, just our usual town insomnia. Or maybe it was just that I wanted to start early because of water issues. Our evening water is 14 miles from town, so we needed a morning start. We ate a quick breakfast at the mini-mart, then got a ride back to the trail from the motel owner. 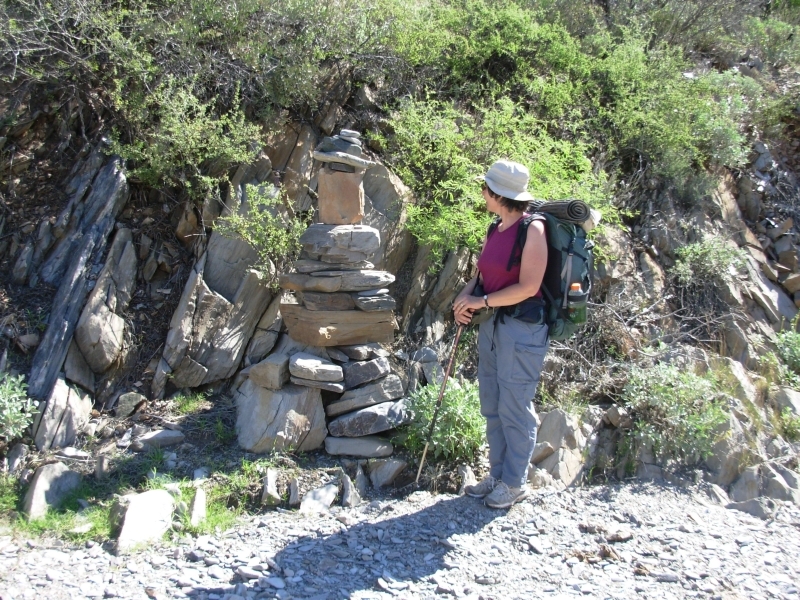 Our packs were heavy with six days food and 3 ½ quarts water. There were lots of cars at the trailhead, mostly hikers climbing Picketpost Mountain. That would be a hard climb. 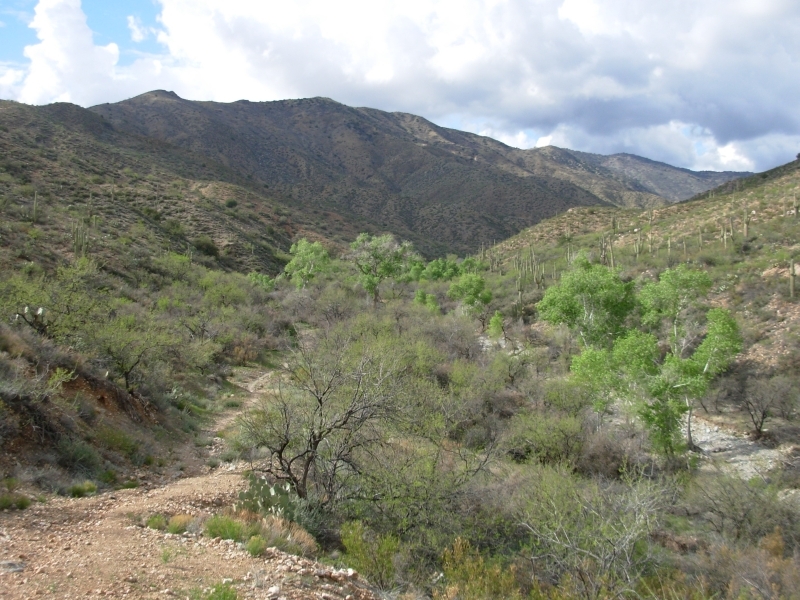 The Arizona Trail Association has built two miles of new trail above the wash, but then we rejoined the old trail that follows the dry streambed uphill. Unfortunately, we went the wrong way and headed back south on the old trail. West actually. It was when the trail turned south that we realized we’d gone the wrong direction! After we got that straightened out, we followed the wash for about three miles. 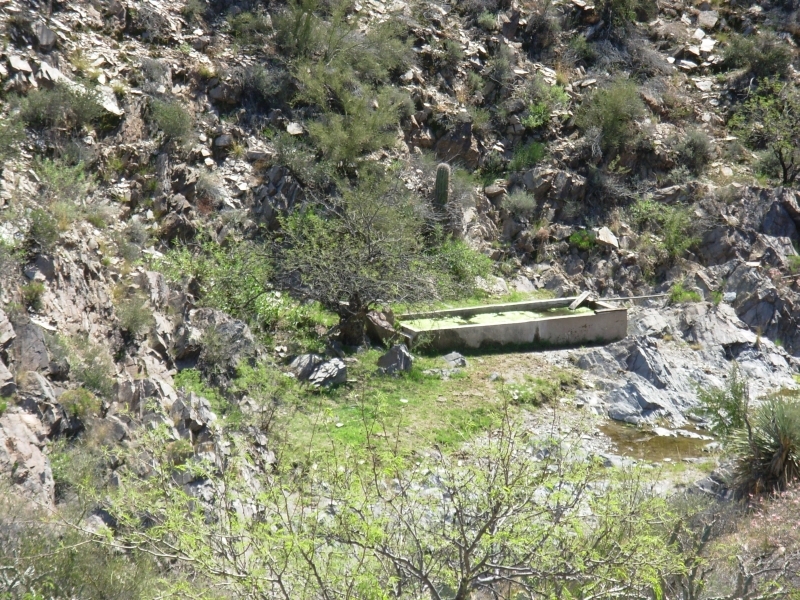 There were pools in the streambed and a windmill that seemed to be filling a trough a quarter mile downstream. We drank and filled up at a couple of rocky pools, ignoring the cow pies that surrounded them. We didn’t see any cows today, though there were several yesterday. 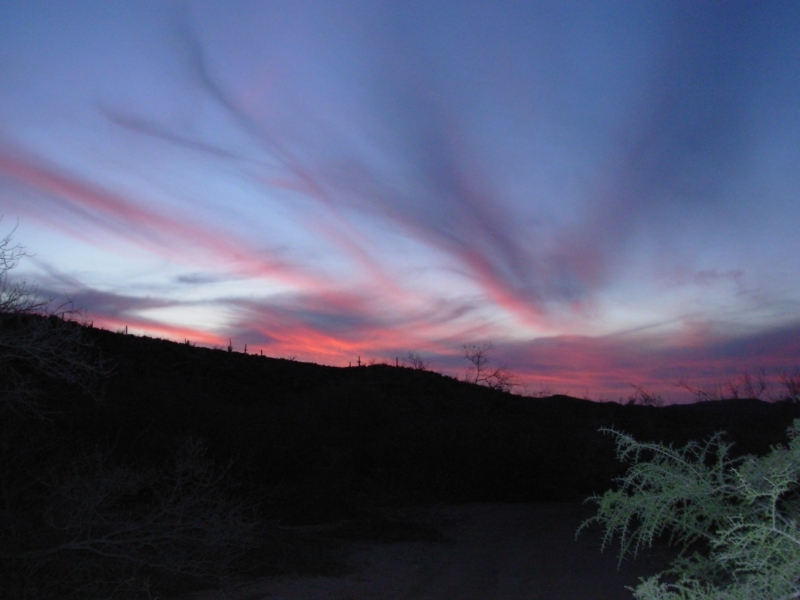 We did see a pair of hawks soaring high above us and an owl that we startled in the upper canyon. 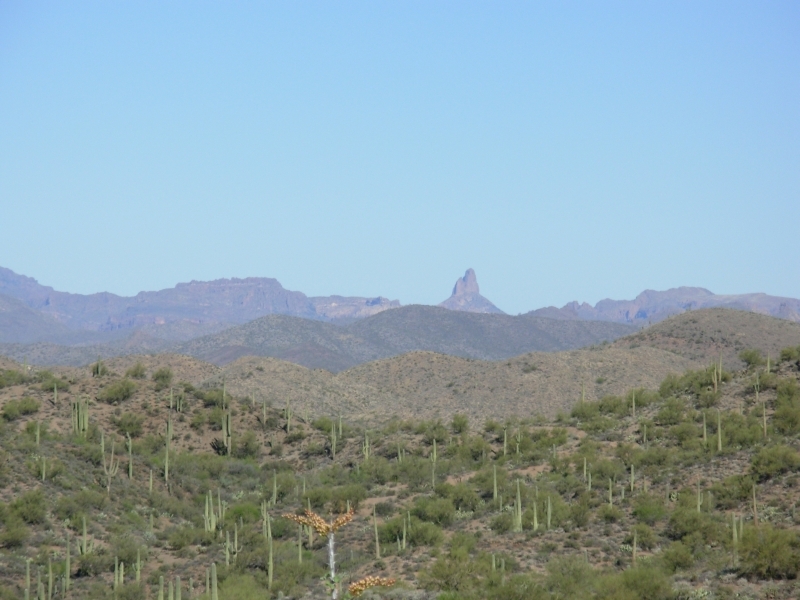 We had nice views of Picketpost and back toward the Superstitions and Four Peaks areas. Weaver’s Needle is really distinctive. We passed that on day one, but we can still see it. The afternoon was visually pleasing, but the trail wasn't. 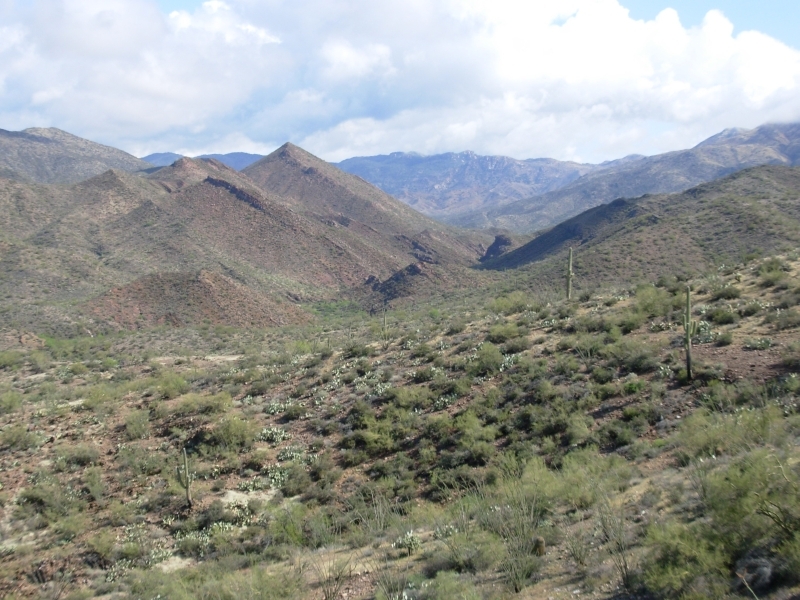 There were great views – huge cliffs and canyons, towers, orange and yellow sandstone, lush desert – but first we climbed steeply up and down on a 4WD road, then we took off into White Rock Canyon Wilderness Area on steep, narrow, obscure, overgrown trail for a mile or so. We lost the trail several times, got caught by encroaching cactus that crowded the trail, and then Jim fell about six feet off the trail, miraculously missing any cactus. It wasn’t a lot of fun. We descended on old two track – steep and eroded – for a couple more miles. We were very sore and tired by the time we reached a jeep road outside the wilderness. From there it was less than a mile to a gushing artesian well. 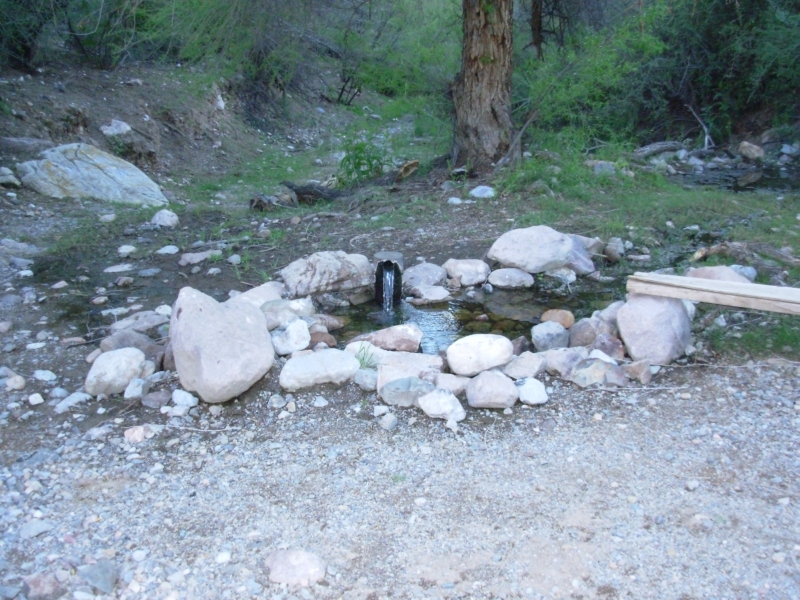 The artesian spring had very warm water – 90 degrees or more. 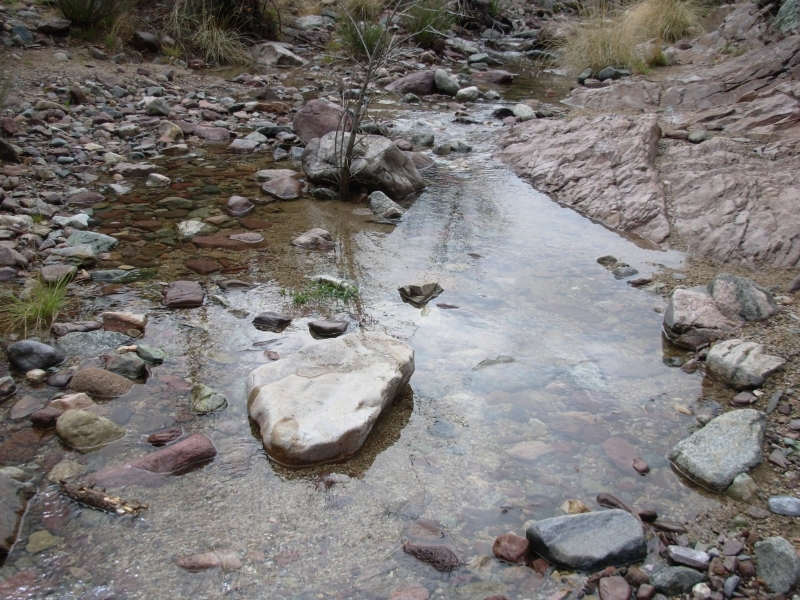 Today the stream beds all had pools of water and the stream was running in places. 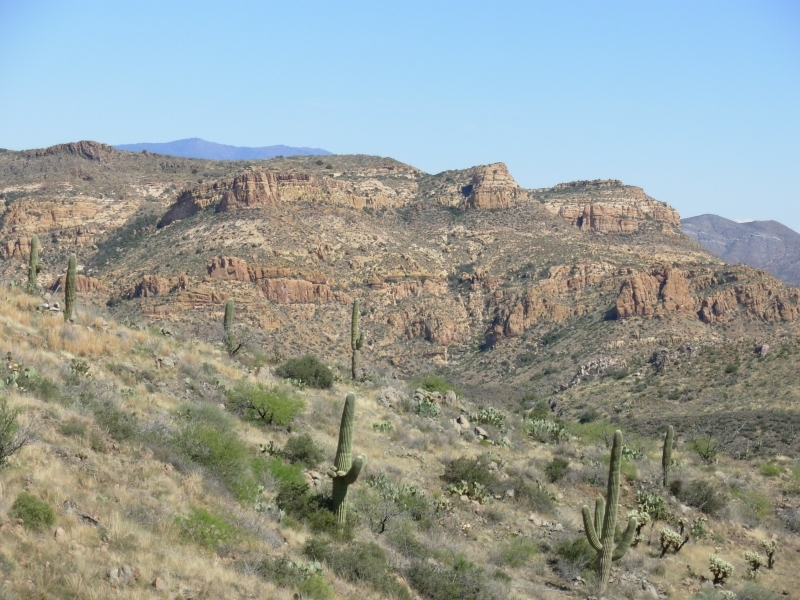 Not your typical desert hike. We’re camped next to the road – too close, but we didn’t want to be next to the spring in case any late night campers arrived. We didn’t want to get run over! 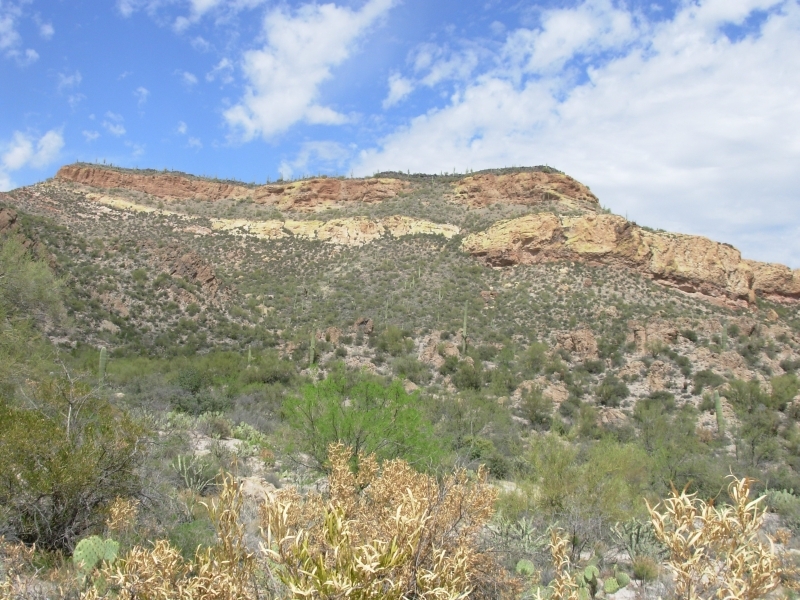 We’re surrounded by 200-300’ high sandstone cliffs – very dramatic. 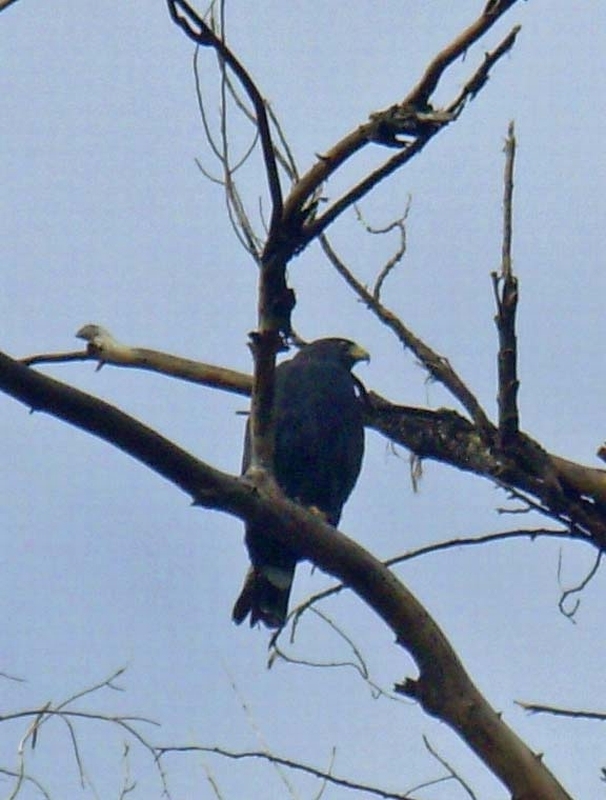 Our only wildlife was birds (another hawk and several vultures) and a striped snake. We ran into a large group of ATVs on the jeep road. They looked like they were on a tour. That’s very popular around here. The walk was downhill most of the way, so it was easy, but since we were each carrying a gallon of water, we weren’t as fast as usual. Water is iffy today. 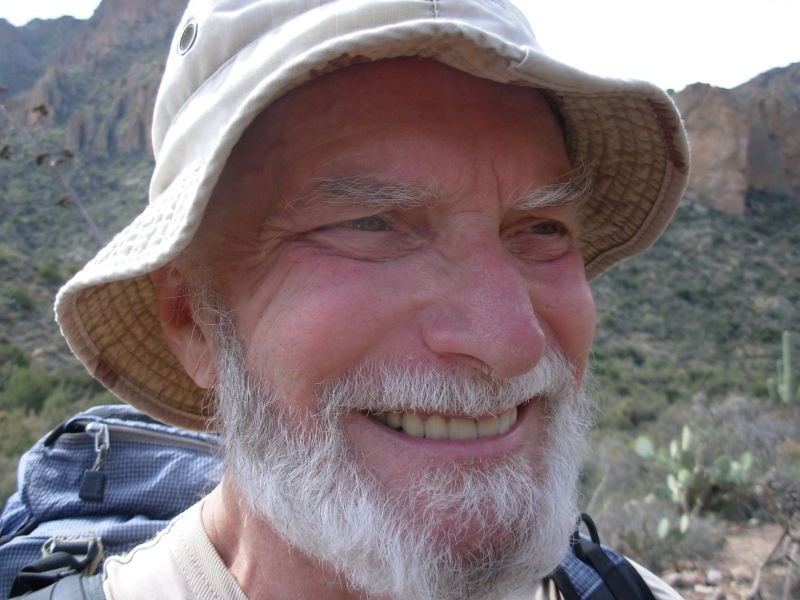 The sources listed in the guidebook include knocking on someone’s door in Kelvin or drinking the polluted silty Gila River. At the end of the day (19 miles) we’ll reach a cow tank. Other than that, the route is dry, so we’re carrying a lot of water to get us through. The afternoon hike was much nicer than the morning walk. We ate lunch hidden under a mesquite tree next to the road. 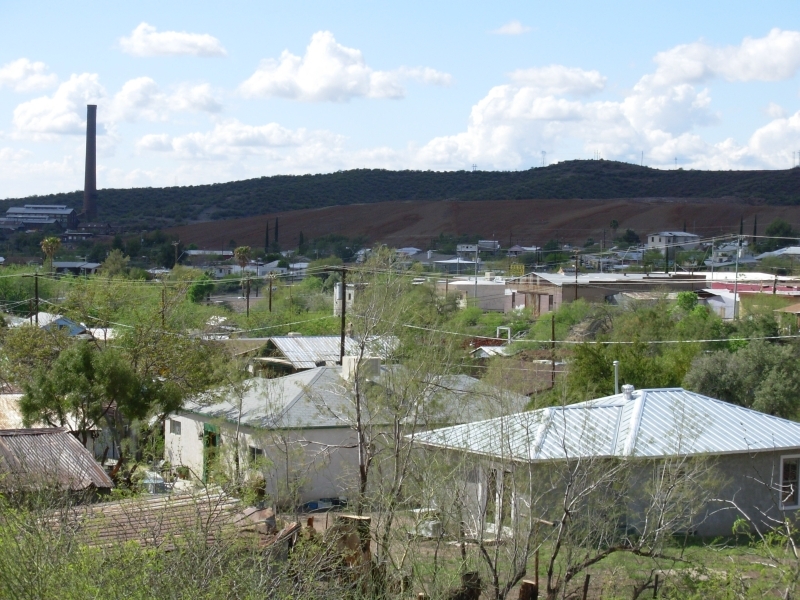 We followed a road through Kelvin, a small collection of houses and trailers – workers’ quarters for the mine, I assume – over the Gila River on a bridge. The water was definitely undrinkable. 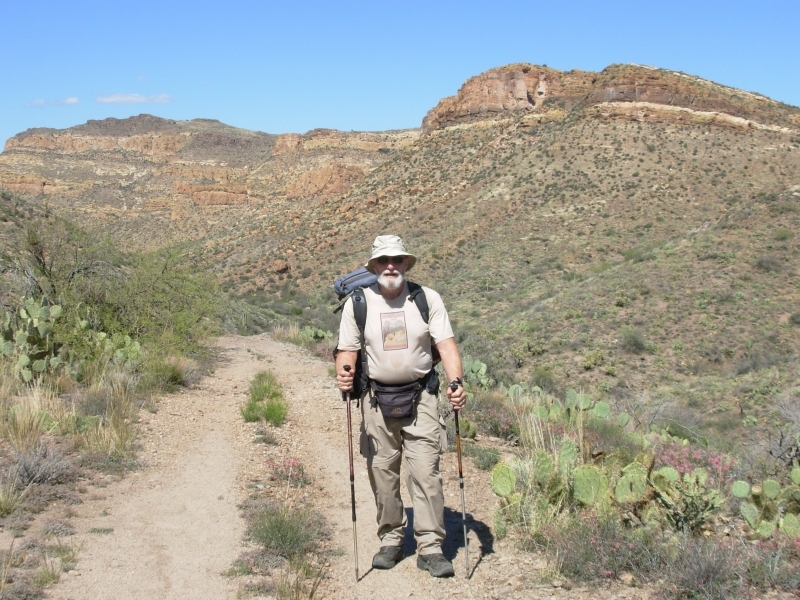 Shortly beyond the river we met a BLM Ranger, Jeff Lark, who leads a crew building the Arizona Trail in the section we walked around. He said the trail construction is a ten year project. He gave us some good cold water from his truck. I drank too much, too fast, and ended up feeling leaden. He was quite excited to meet hikers on HIS trail. 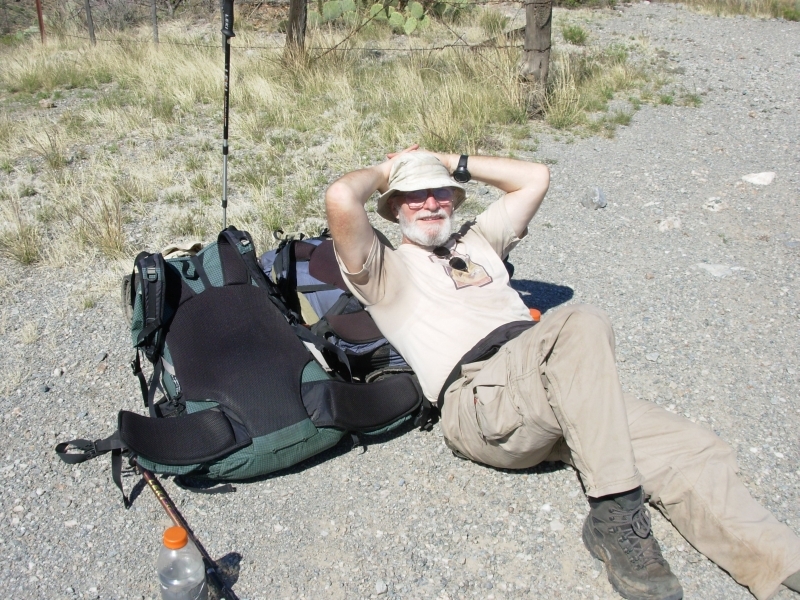 He said he rarely meets anyone on the AZT, just jeeps and ATVs on the roads. He’d like to see more hikers, bikers and horses. We climbed on good constructed trail for the next eight miles up to a ridge, then followed the ridge to another ridge, then on to another. The views were terrific in all directions. Distance was about a mile more than listed in the guide because the trail wound so much, but it was definitely worth it. 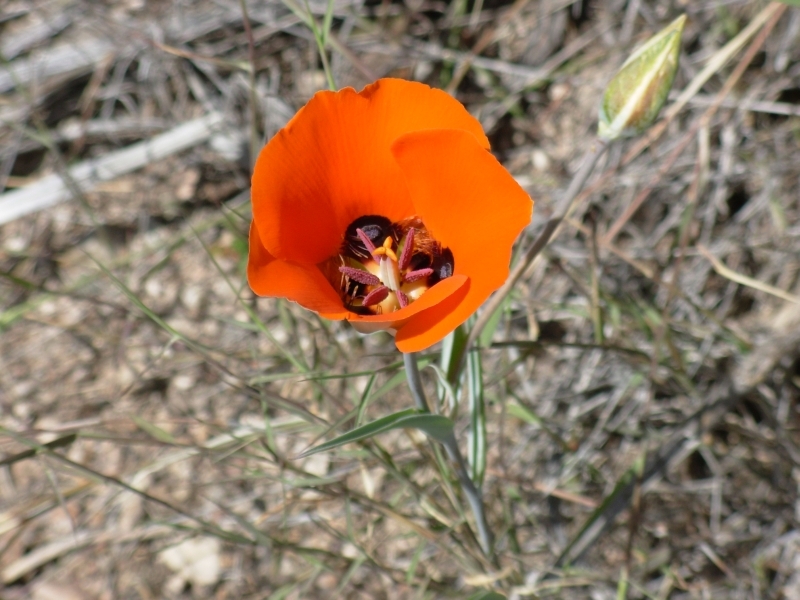 There were lots of wildflowers: poppies, globemallow, lupine, penstemon, bottlebrush, brittlebush, phacelia, etc. 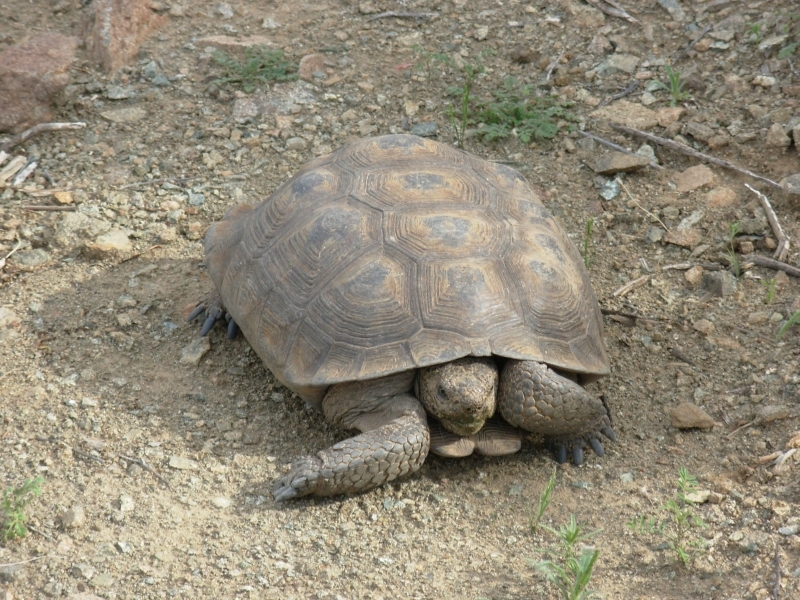 We stepped over a desert tortoise right on the trail, a fairly old one judging by the ridges on his shell. We were a long way above the wash, so I’m not sure what he was doing there. We then descended to a wide wash. A quarter mile down it was a piped spring and cow trough. It was a slow dripper, but had good water. It took about 45 minutes to fill up our bottles, but at least there was water, so I was happy. 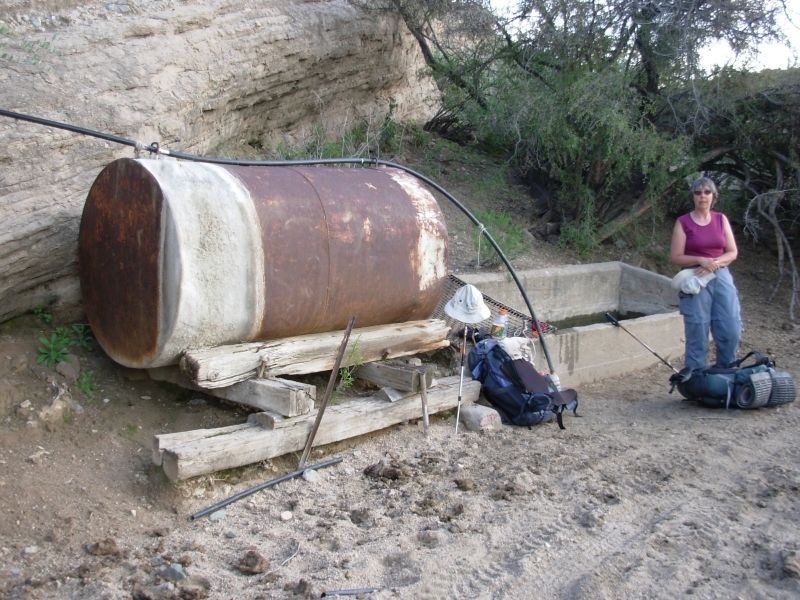 We didn’t camp nearby, but went on back to the trail, carrying a full water load. Once again we made camp just as the sun set. We were sore and tired, but content. The afternoon hike on good trail was a real pleasure. It was a breezy morning, so relatively cool for hiking. 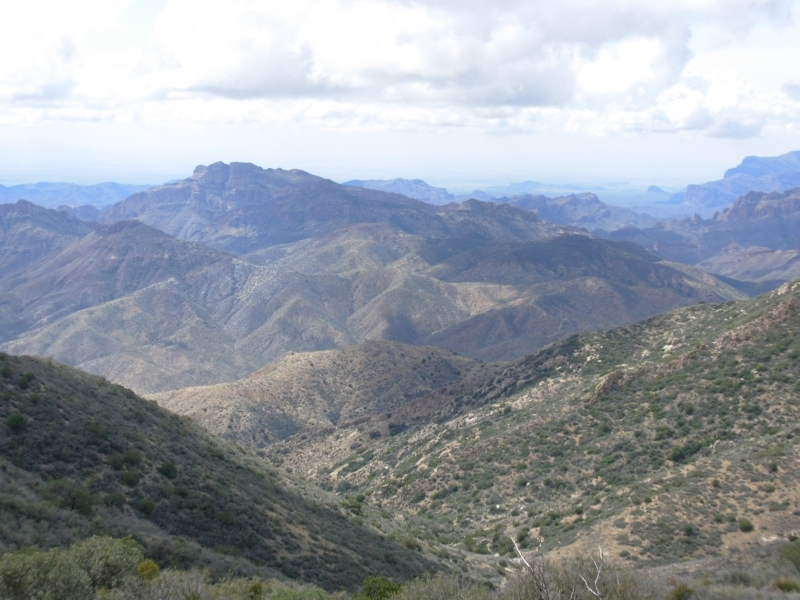 The trail wound through the Tortilla Mountains, climbing gently up and down through the hills at about 3500’. We alternated between foot trail and old two-track. Our only interesting wildlife encounter was a rattlesnake I startled as it lay next to the trail napping. I’m not sure which of us was most scared. I didn’t see him until I had stepped past him and heard the rattle. I jumped and let out a shriek. Jim was laughing too hard to get a good picture. (He bragged about me to my brother recently, saying one of the things he liked about me was that I don’t scream when I see snakes. Well, he was wrong. I sometimes scream, but only when I’m started by them.) We saw lots of rabbits in the wash last night and one jack rabbit this morning. There are lots of wildflowers, especially purple phlox, today. The rain last week has really made a difference. There was no certain water en route today. The one spring a mile into the day was dry. We don’t reach the next stock pond until noon tomorrow. 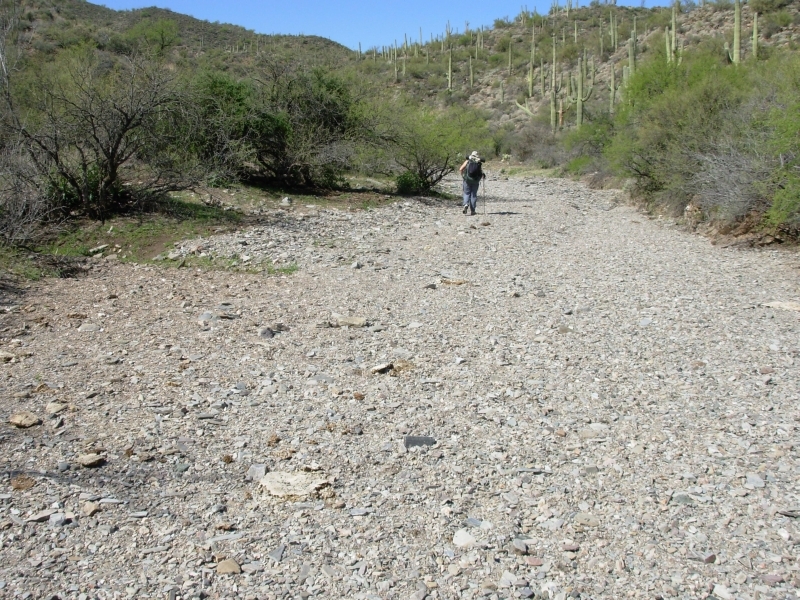 We were told that there might be a water cache for Arizona Trail hikers near a road that we will reach late in the day, but we shouldn’t count on it. I really don’t like long waterless stretches. It makes me thirstier, just knowing I shouldn’t drink. I especially don’t like the fact that I feel pressure to make miles, which I hate. Unfortunately, water is an issue for most of the GET, so we’ll be doing a lot of long mileage days. The afternoon hike was fairly flat and easy. 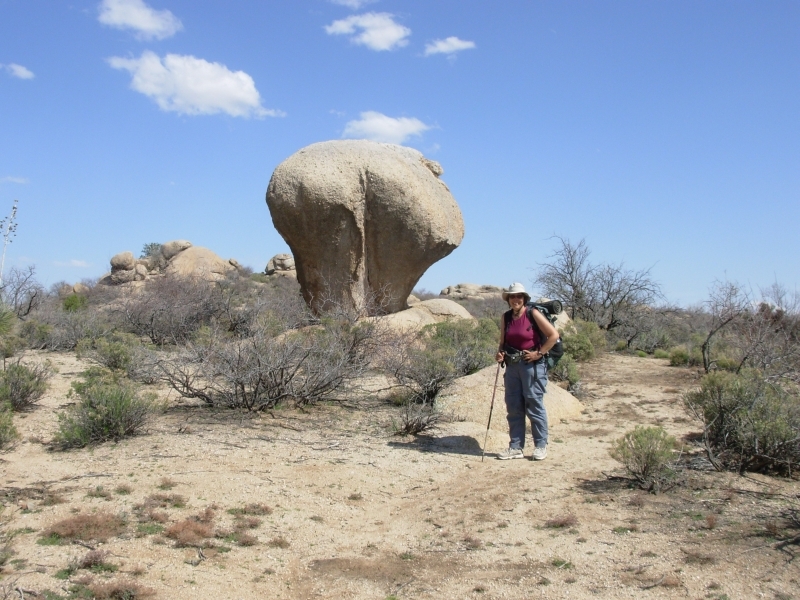 We ran into recent trail work near “the Boulders,” a big granite outcrop, but other parts of the trail were pretty obscure, with faint tread through the grass. Recent bike tracks helped keep us on course. Multiple cow tracks didn’t. We got lucky; there was water in the cache. Not much though – there were only two gallons left and we took one, then we found another full bottle around the corner, but we left that one for Sly. Sunlight had destroyed the plastic on some of the jugs. We picked up a gallon and the handle fell off. 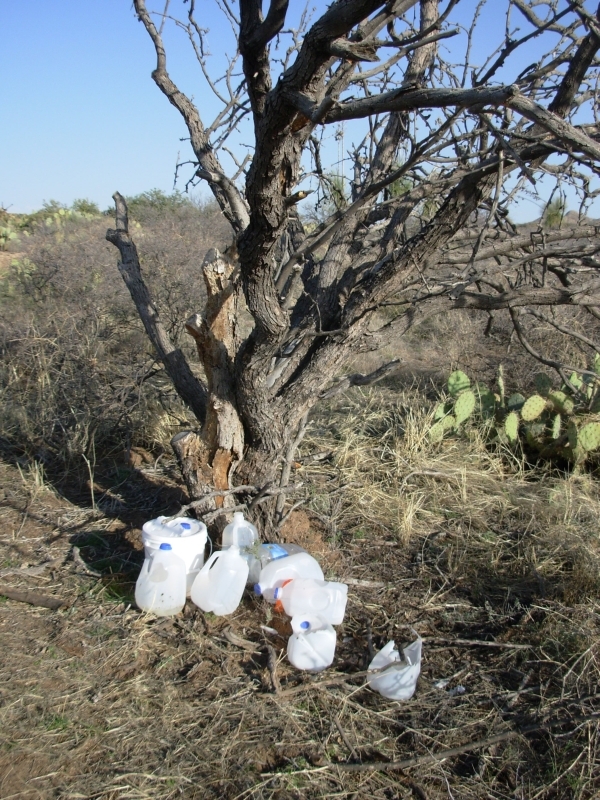 I don’t know if hikers got to enjoy any of the water in the broken crumpled jugs before they fell apart. I hope so. We stopped for the night soon after reaching the water cache. I’m tired of pushing until dark. It still isn’t a short day, but at least we’re eating while it’s still light. We found a nice campsite, but it was so windy we had to leave it and look for a more sheltered spot. The wind blew noisily until the wee hours. The tent flapping and sudden gusts kept us awake long after the aches and pains in our feet and legs began to settle down. Finally, and unexpectedly, it began to rain and the wind died off. After covering the packs, we both finally fell asleep listening to the gentle pitter patter of rain on the tent. By morning all sign of the storm was gone except that the temperature had dropped ten degrees. It was cold! We followed good trail winding through the hills behind Antelope Peak for seven miles, then headed down broad Putnam Wash. We stopped to check out the windmill (working!) but didn’t linger. The walking was easy and quick. A couple of nice hawks flew overhead and we saw rabbits and cows, but no other wildlife. We passed a side canyon with a spring 1/3 mile up. We didn’t need to check it out, the creek was running into the main wash. 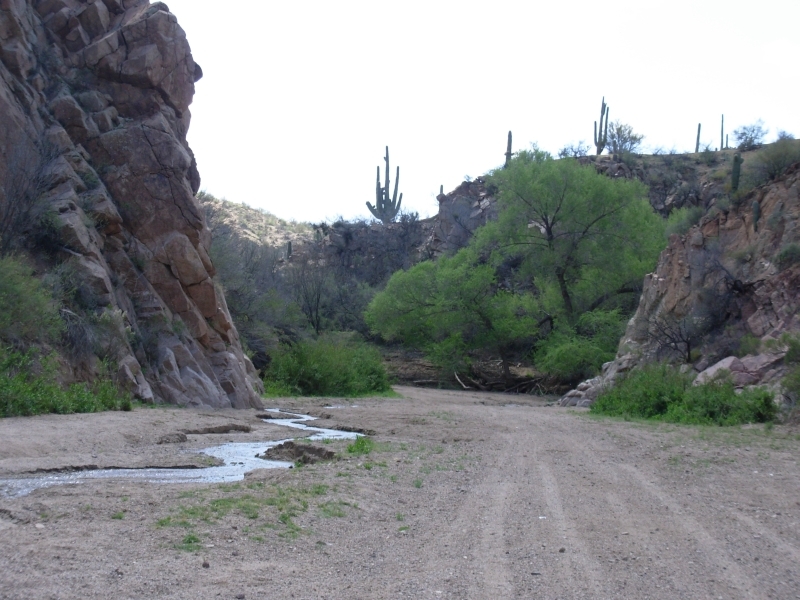 It was pretty through there, with red canyon walls and lots of saguaros, then green cottonwood trees and mesquite. 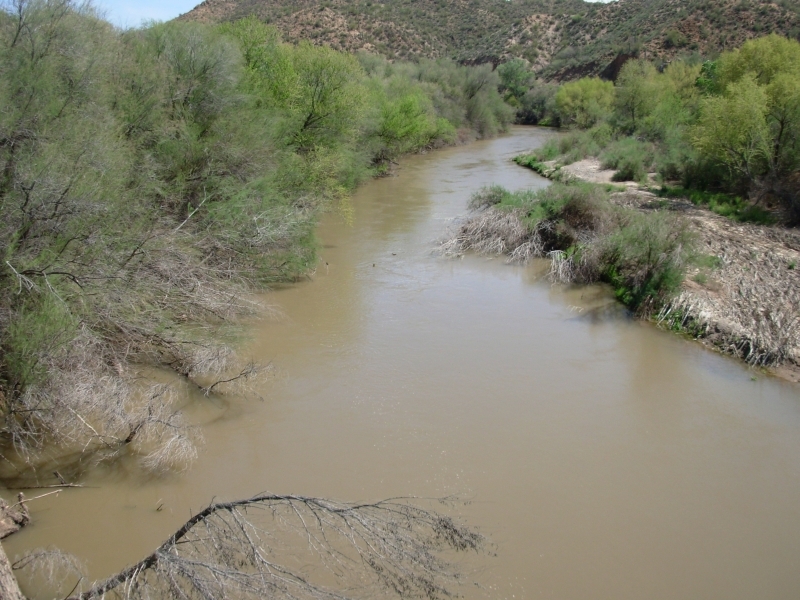 When we reached the San Pedro River, we decided to take the route that leads directly out to Aravaipa Canyon Road, but got caught up in a tangle of trees, multiple water channels and flood debris. It took a while to get out to the highway, but somehow we managed to come out at the right spot. Not that it does us much good. 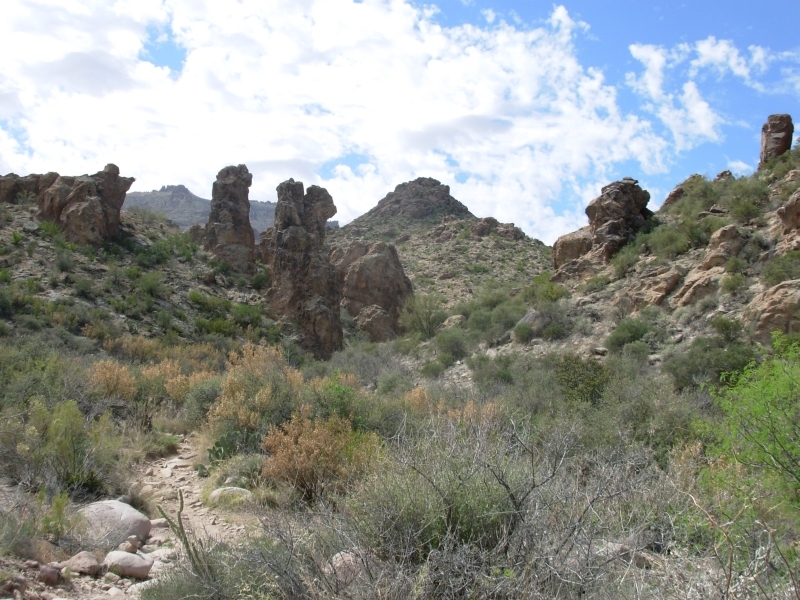 We can’t get a permit for Aravaipa Canyon – they’re booked until Monday – so we have to walk through Mammoth on an alternate route around the Wilderness Area. That was a disappointment. 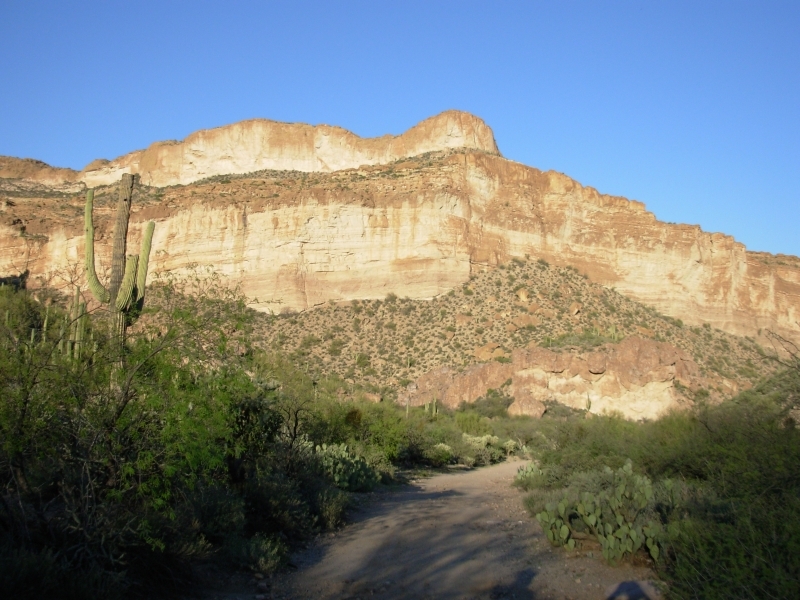 I’ve wanted to hike in Aravaipa for years. We got a ride ten miles to town and learned about the permit situation. And then there were no rooms available at the only motel in town. We get to camp out again tonight. We decided to stay an extra day so we can get a room with a shower before we head out on this next 120 mile section. I need to feel clean again! We also need clean clothes and groceries, which are both a mile out on Main Street. We were told we could camp at a roadside park, but it is right next to the highway with no outhouse. I don’t think so. We decided to go down to the river where we should find a stealth spot. I am not happy right now. Nothing is working as planned. We didn’t sleep much last night. There were too many thoughts spinning around in our heads, too much pain from throbbing feet and legs, too much noise from the coyotes teasing the town dogs, plus cars that kept driving past our hidden campsite. We got up at 7:30, packed up and walked to the laundromat where we finally got our clothes clean. After two weeks in the desert, they reeked! We enjoyed a leisurely breakfast and finally, at noon, went to the motel so we could check in and get cleaned up. Unfortunately, no one was home, so we couldn’t check in as agreed. Frustration! It was another hour before the manager showed up and let us in to our room. The result of last night’s tossing and turning was a decision to leave the trail. We keep running into roadblocks, not our usual smooth sailing, and are left with the feeling that this is not what we are supposed to be doing right now. I’ve never quit a long hike before. Yet it is stupid to keep going when your heart’s not in it. And ours aren’t. The only reason to continue is pride, and that’s just not good enough this time. The past few days have felt like a death march; the joy just isn’t there. The land is beautiful and I’ve enjoyed all the wildflowers, but I don’t want seven more weeks of it. Another issue is the fact that other places are also calling, like Utah. Our plan was to hike the GET and then spend a couple of weeks in Utah before heading north. I would rather spend more time exploring Utah, if we can. Then there’s the problem of some spots on Jim’s face that need to be seen by a dermatologist. Last year’s scare with the carcinoma on his hand have made him a bit wary about sores that don’t heal. He’s gone to the skin doctor every January for years, but we skipped it this year. His fair skin burns and develops pre-cancerous spots quite easily. The last couple of weeks he has noticed some new rough spots that are questionable. We decided that it would be foolish to ignore them. Reality is, long distance hiking requires a total commitment to the goal and, for whatever reason, Jim and I just aren’t feeling that commitment this year. It’s not the trail. 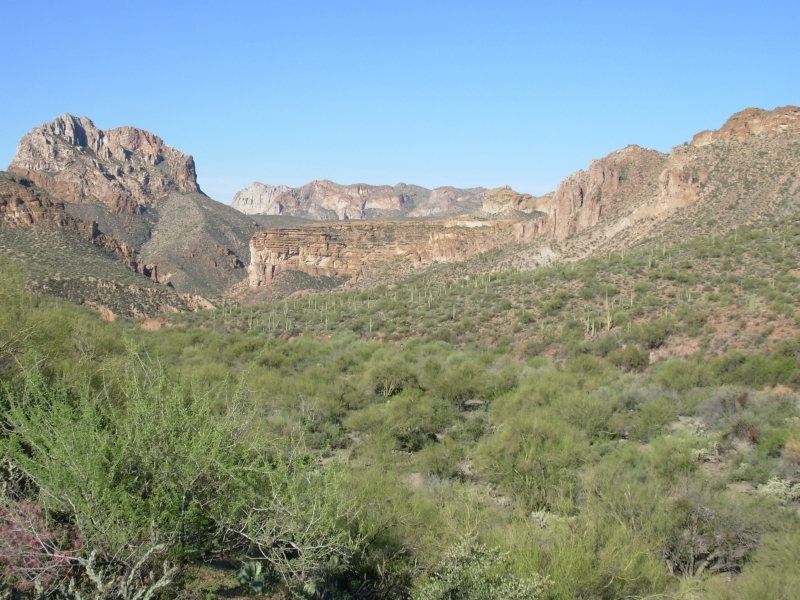 We’ve enjoyed the beauty of the Sonora desert and we’ve been mostly hiking on either the Arizona Trail or the managed wilderness trails in the Superstitions. There were some rough spots, but mostly we’ve been following decent trail or jeep roads. That’s part of the problem. We’ve done the easiest part of the GET and ended up sore and exhausted. We were about to begin the cross-country sections and I’m not sure I’m up to that right now. We roadwalked around the last bit of non-trail. We can’t do that for the next 600 miles. Bottom line: we don’t have any really good reasons for quitting, just a lot of little reasons that add up to a decision. Basically, it comes down to the fact that I’m tired of being tired and Jim’s inner voice is saying this isn’t where we’re supposed to be right now. So on to Plan B.